I was recently contacted by Doug Pike, the cartoonist whose wine-related humor has been published on the subscription-only portion of eRobertParker.com for about four years now. 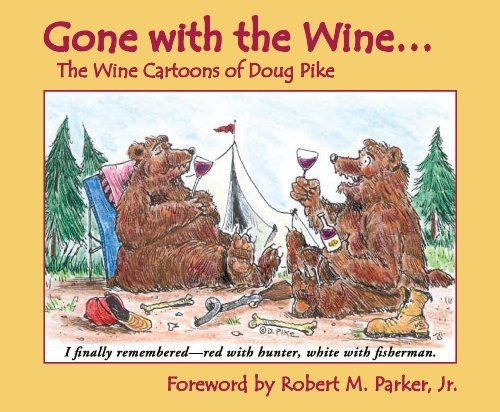 Doug has released a collection titled Gone With The Wine, which pulls together about 100 of the cartoons that appeared on Parker’s website (Parker supplies the book’s foreword). Doug came across 1WineDude.com via my recent contribution to CNBC’s Wines for the Holidays, and has become a fan “mostly because of your non-elitist approach to wine, which I share.” Amen to that, brother! 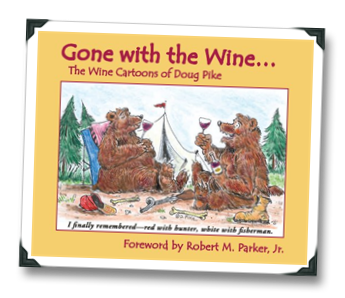 Doug was kind enough to send a review copy of Gone With The Wine and also give permission for me to post some of the cartoons from the book. While some of the cartoons are clearly geared towards the fine-wine-loving crowd that have made Parker a household name, I found myself chuckling more often than not at the fun being poked at wine geeks (myself included among those ranks) throughout Gone With The Wine. The cold hard truth is that we really are that goofy – and long may we remain that goofy, so long as we take the wine – but not ourselves – seriously. Truth be told, even I’m getting sick of hearing about how great I think Riesling is. 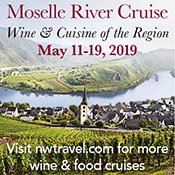 Having said that… I cannot resist the temptation to relay some interesting facts about how Riesling is able to translate a sense of place so well. No surprise then that this book isn’t exactly lighting up the Amazon.com sales rank charts (currently, it’s at number 2,832,386). 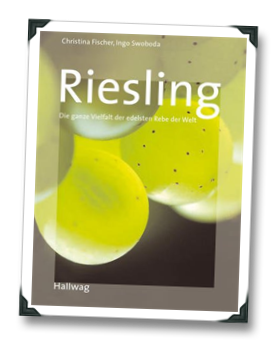 But, that doesn’t stop the book, titled simply Riesling, by Chrstina Fischer and Ingo Swoboda, from delivering a masterstroke of Riesling wine appreciation. At least, it did for me. 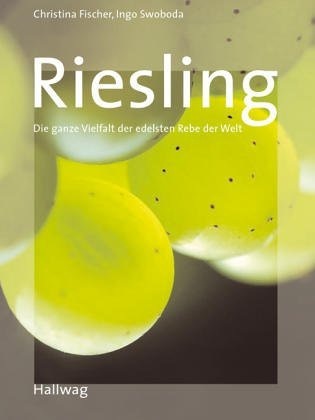 (Indeed) Chapter three of Riesling is (indeed) so freakin’ awesome that I’m going to summarize a large section of it, because it provides what might be the most eloquent overview of the link between Riesling wine aromas and soil types that I’ve ever seen. (Indeed) It’s like the f—king Rosetta Stone for translating Riesling soil types! I seem to be in ‘book mode’ the last week or two. I’m a bit of a bookworm, so it’s fun for me to mess around at the intersection of wine and the printed word. I still don’t own an eReader device, by the way – I prefer Book 1.0 – you know, the kind with actual pages that you can stick a bookmark between. Anyway, here’s another piece of printed word that intersects with the wacky world of wine. 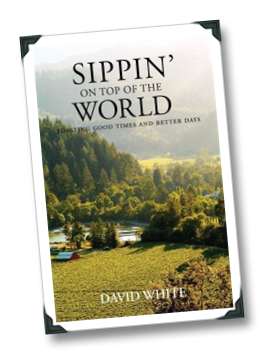 David White’s Sippin’ on Top of the World: Toasting Good Times and Better Days, of which I recently received a sample copy, is a bit of a strange book. In fact, I’d go so far as to say that it’s being misrepresented. At this point, your mind may be screaming “CULT! CULT!” and planning to run away as quickly as you can lest you be tainted by the odiferous funk of the religious cook. It would be an understandable reaction, though one that I’d argue was totally incorrect. To many people, the charismatic front-man of the iconic Boony Doon wine brands, Randall Grahm, is the Mad Hatter of the wine world. Once they read Randall’s recently-released book, Been Doon So Long: A Randall Grahm Vinthology, those same people will realize that they’re dead wrong. Randall Grahm is not the wine world’s Mad Hatter; Randall Grahm is the wine world’s Cheshire Cat, equally (and eloquently) adept at satirizing the modern trends of the wine industry as he is at continually surprising wine consumers with quirky, excellent wines inspired by a desire to transmit the equally quirky and excellent message that California’s terroir has to tell. Been Doon So Long is, at times, a masterstroke; it’s just as interesting, funny, poignant, and acerbic as any wine that California has ever had to offer. 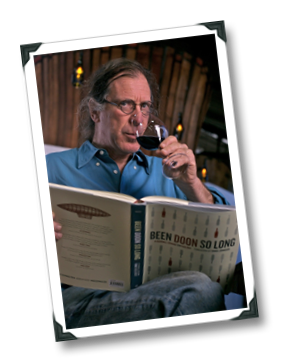 Clearly an avid lover of literature, music, and wine, Randall Grahm has somehow managed to utilize all three as he takes us through the history of Bonny Doon, offers intimate glimpses of his personal demons, and sends up many of the wine world’s most sacred cows. If he has a mad hat, Grahm is clearly capable of pulling rabbits out of it – both when it comes to wine and when it comes to writing. 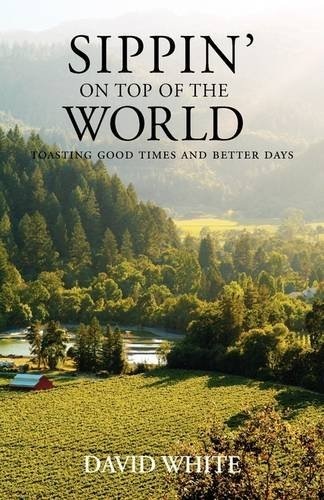 Been Doon So Long is a unique work, and while it might not be the kind of book that you’d expect from the world of wine, it’s probably the book that the wine world deserves right now. I found reading the book to be rewarding, but rather like the fabled rabbit hole, the deeper you get into it, the more difficult it becomes to fully explain. Which is why I figured I’d let someone msarter (Randall) explain it instead. Following is an interview I conducted with Randall this week while he’s in the midst of his promotional tour for Been Doon So Long. Like the book, the interview will give you a glimpse into the rabbit hole of Randall’s mind. You’ll encounter below a guy with a formidable prowess with the written word, strong opinions, a consuming passion to find a Californian wine that truly speaks of its origin, and who isn’t afraid to wear his emotions in plain view.